How lovely to see the beautiful Angelique modelling :) She's such a beauty. She is growing so fast. I realise how long we have been both been blogging when I think I remember her as a a tiny little thing. And yes, your sentiments about winter are my own, it is a season that holds much promise. Beautiful post as always Stephanie, and your shoes are exquisite. The lace is pretty. I like the slope that makes it looks like a shrug over a lacy top. Your daughter is a darling. What beautiful leather goods at that website. Well as you know Stephanie I'm not a fan of winter but we have to find the beauty where we can and of course according the GRD calendar it is only a short season. Angélique's sweater is so pretty and those ginko leaves are stunning. Enjoy your trip to Paris and I am more than a little envious of your yarn shop visit. Angelique is most definitely an angel in these photos.....lovely (as always!) And her new sweater is exquisite---and obviously loved. I'm one of the strange ones, I know, but I love winter. A nesting, homey, knit-in-front-of-the-fire time....soup in the kettle, dreaming of snow on the ground--lending a beauty for our corner of the world that comes so rarely. Yes---I really embrace this time of year. Oh my goodness she just gets more and more darling everyday. Love your knitting and of course those cute shoes. Enjoy your journey to Paris and that wonderful shop. Oh my....those precious little shoes. But the best of all is the sweet little angel wearing her mum's creations. Stephanie, how glorious is your vision. Sugar plums dancing in my head, thanks to you. Unless I can enjoy winter I go crazy! It has its own beauty, and the dark evenings encourage reading, knitting, and cozy living. Also, thanks for the quote from Elizabeth and her German Garden. I just went and bought it. Another winter activity is garden planning. Angélique's pretty top looks wonderful. You're so clever at those tricky stitches and I love the design detail on the back. Have a fantastic time in Paris Stephanie as I'm sure you will. :) It's one my most favourite cities and I yearn to go back there again! Has Angélique grown another few inches since modelling your last delightful knit? It looks as though she may have! P.S. Thank you for the gentle reminder to seek the beauty of winter. Our world is black and white and grey at the moment - but the trees are very lovely against the sky as they stand at rest from their year's labours. 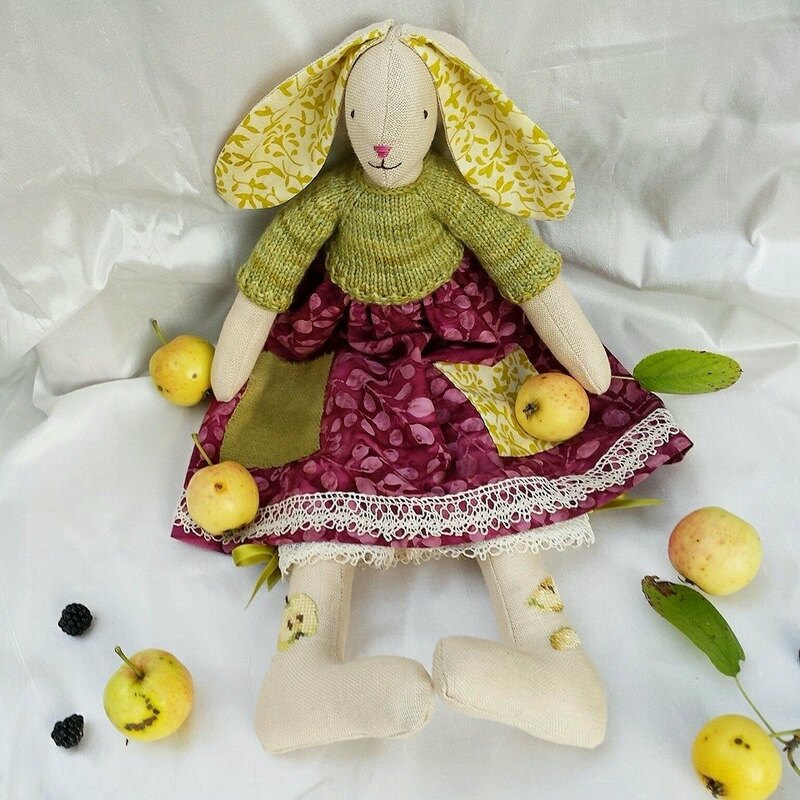 Stephanie, your late November colors from nature and from beautiful yarn and storybook slippers make a wonderful bouquet! Thank you for giving us this view of a particular transitional seasonal time. What a little beauty Angelique is! It's so clear how much she does enjoy the knitting that you do just for her! Please do have a grand time in Paris. I know of that yarn shop (but have never visited it myself) and look forward to getting a review from you upon your return home. Beautiful, as always! I hope you had a wonderful weekend -- especially in those beautiful new shoes! What a treat! Golden leaves, Angelique's beauty, the most delicate pink lace and Elizabeth von Arnim's words! I am a lover of her writings, and especially of Elizabeth And Her German Garden. No need to say that I am also in love with your pink shoes! Angélique is beautiful in her delicate knitted sweater! Have a wonderful month of December Stephanie! I wish you a merry holiday season with your family! Hope you had a lovely time in Paris Stephanie! Angelique is a perfect model. Her new pullover looks beautiful on her. Such a coincidence to see a quote from Elizabeth von Arnim's book. It's on my bedside table at the moment :-). After all those years it's still a good read! What a timely reminder, and I too have recently been reading Elizabeth von Arnim but somehow this did not jump out at me as it should. Enjoy Paris! 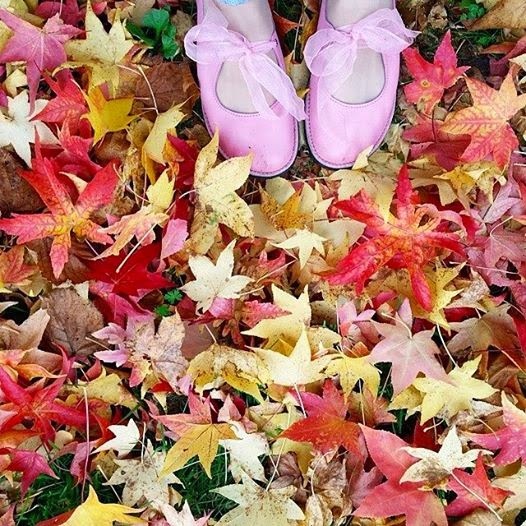 Love those fairy shoes Stephanie ….don't they just stand out among the colours of those leaves. You just can't beat the colours of nature what ever the season ….and who ever said winter is barren cannot see for looking!!! :-) Sweet sweater for a sweet girl…she is gorgeous! Enjoy your time in Paris!! !